Some times you get to camp and clouds are covering every star in the sky, other times the moon is full and you can barely make out the brightest of stars. But in rare moments, the stars alight (pun intended), and you get zero light pollution and a crystal clear sky. This is the result. After driving the 4 hours west, across I-80, passed the Salt Flats; we finally reached Angel Lake in Nevada. Elated that we finally were out of the Jeep, we still had one more problem to deal with. Finding a camp site. Around and around we drove through the campground. Every spot was full, except one. The handicap accessible spot. Guilty about even thinking we should take it, but it was nearly 11PM, and the odds of another camper coming, let alone one in a wheel chair were slim. So we walked over to the campground host to see what his thoughts were on taking the spot. We knocked on the door of the RV. A few moments later, a weathered man with a scraggly beard answered. “What can I do for you?” He questioned in a raspy voice. We made our ask. He scratched his beard as he thought. “Sure. I don’t care. It’s up to you.” And that was all we needed to hear. We quickly unpacked our jeep and made camp for the night. We were finally settled and ready to enjoy the long, Labor Day weekend. At that moment we noticed the sky above us. It was stunning. You could see every single star in the sky. The Milky Way was as clear as the photos I’ve ever seen of it. The stars were a perfect backdrop over the mountain range that stood high above us. It was breath taking. After we picked our jaws off the floor, we quickly ran to our camera bags to pull out the necessary gear. The 14mm lens, the G85, and the tripod. Shooting night-time photography and the stars is always a challenge. No to scenarios are alike. The ambient light can really through a photo off when using long exposure. So began the trial and error. ISO 800, f/3.5, 5s. Too dark. Bump up the ISO. Still too dark. Drop ISO and extend shutter speed to 10s. Back and forth I tried every combination. Some times I think I have it, then double check, and realize it could be better. The hardest part with this type of photography is how much your eyes adjust to the darkness and the only light comes from your camera screen. Your eyes are so sensitive, it makes your stars look so much more pronounced, but when you get back to your computer the stars don’t look nearly as stunning. To guarantee you captured the stars, you need to sometimes over-do how much stars you capture. For a full, in-depth, instructions on how to shoot the stars or night photography, see this post I did titled: Getting The Shot: Shooting the Stars. I eventually got to the settings I felt confident in, with a 30s shutter. It was coming together. Amidst my trial and error, Gregor, our 4month old puppy, decided it was bed time. He jumped into the tent, still wearing his light-up collar. At first, I didn’t think anything about it, but after I hit the shutter and the photo came back, it was perfect. 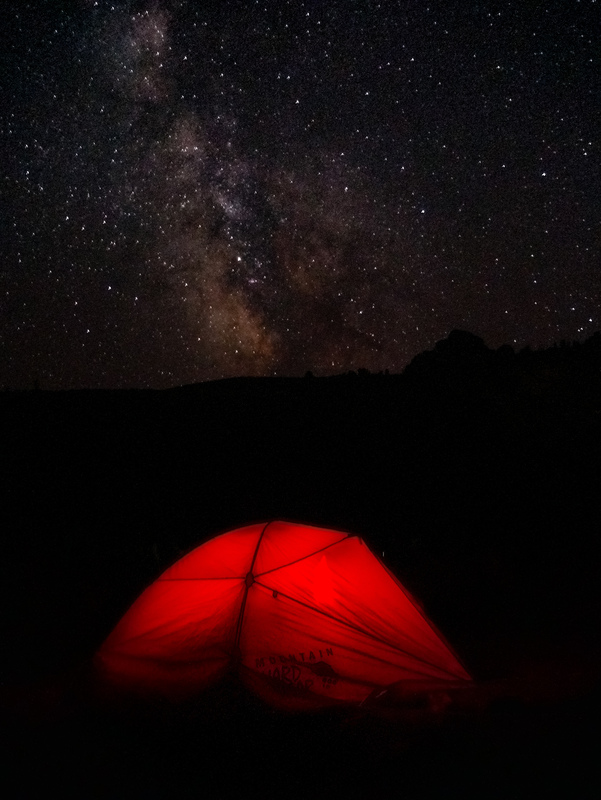 The dull, red light of his collar illuminated the tent perfectly in the foreground without overexposing the sensor. The silhouette of the ridge in the middle of the frame. And the striking Milky Way Galaxy clear as day. It was perfect. The only way I could make this shot better would be if I had a lens with a 1.2 aperture on a full frame sensor. That way I could allow more light in through the lens without having the shutter open for that length of time and the ISO bumped up so high. That would reduce the amount of noise in the photo and also reduce the amount of post-production on the photo needed.